As regular readers of our blog will know, the Raptor Hospital at S.O.S. sees a steady stream of visitors throughout the year and this last week was no exception with three 'patients' brought in from the wild in various states of disrepair. The week started with a pair of Tawny Owls involved in separate road traffic accidents - RTA's as we call them, which regrettable appear to the prevalent cause of wild bird-of-prey injuries we come across. One of them had a badly bruised wing and the other had received a serious knock to the head, as the accompanying images will illustrate. The good news in both cases is that with the right care & treatment, we should be able to help both through to recover and release: it's too early to tell yet, but 'watch this space' and we'll let you know how they get on - one thing you can be sure of is that we'll give them out best attention. Our other visitor this week was a Barn Owl brought in by a member of the public in a very withered state and who was pretty obviously suffering from a lack of food - not unsurprising as the area has been covered in snow turning to ice over the past week of enduring bitterly cold weather, and this no doubt restricted it's hunting activities. To be honest, when he first came in we didn't think he would make it through the night and would really need some round the clock care to keep him topped up with small amounts of fluid and food. So - much to the consternation of my long-suffering husband who just loves having his slumbers interrupted by the frequent need to help me administer nocturnal avian TLC - I took the owl home with me to keep an eye on things. I'm more than pleased to report that after four days of intense treatment the little beauty has now been re-located back to our hospital where he's enjoying the warmth and food that will set him on the right road to recovery and probably release before very long. 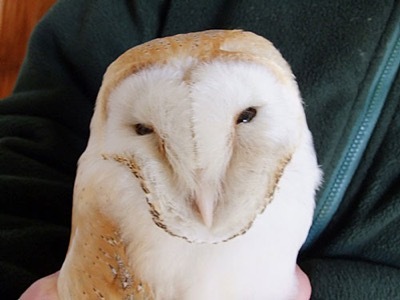 Please keep reading our blog for regular updates on these and our other 'inmates' and if you are ever in our area or planning a visit to the sanctuary, the hospital is open for inspection year round Please also remember that we are here to offer help or advice, or even take in an injured owl or other bird of prey should you be unlucky enough to come across one. If you are not local to our sanctuary and are looking for advice, please refer to our information page “What to do if you find an injured bird” where we list the organisations that should be able to assist you in your area. In most cases, you also have the option of taking the bird to your local vet who have a duty of care to injured wildlife and usually be more than happy to help you.